Inside: Find three of the best kids meals hacks that will even please picky eaters. Plus, get the scoop on a no-fail yummy recipe for rainbow pizza (with veggies… shhh!). I knew from experience if I wanted to cook with my kids, I’d need to do a little prepping beforehand. So, I laid out all of the ingredients for our rainbow pizza, cheesy garlic bread, and veggie tray. I knew from experience if I wanted to cook with my kids, I’d need to do a little prepping beforehand. So, I laid out all of the ingredients for our rainbow pizza. I like to include a variety of colors when I am cooking for kids. That’s the main reason why I choose to make a rainbow pizza. 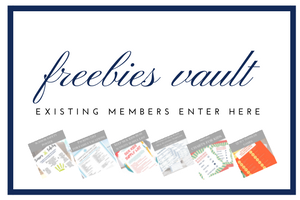 (Get the full printable recipe below.) Kids often enjoy having lots of colors and choices on their plate. One way I include lots of color in kids meals is by incorporating a variety of vegetables, garlic, onions, and herbs. I was amazed by the ownership my preschool daughter experienced when I let her help me grocery shop. She loved selecting healthy items and putting them in the cart. I told her she could pick out anything she wanted from the produce section. Once we were home, she was excited to eat one of “her” items she had selected from the store. 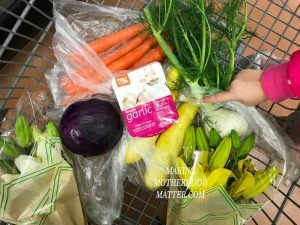 I love using products that make cooking for my family more convenient. 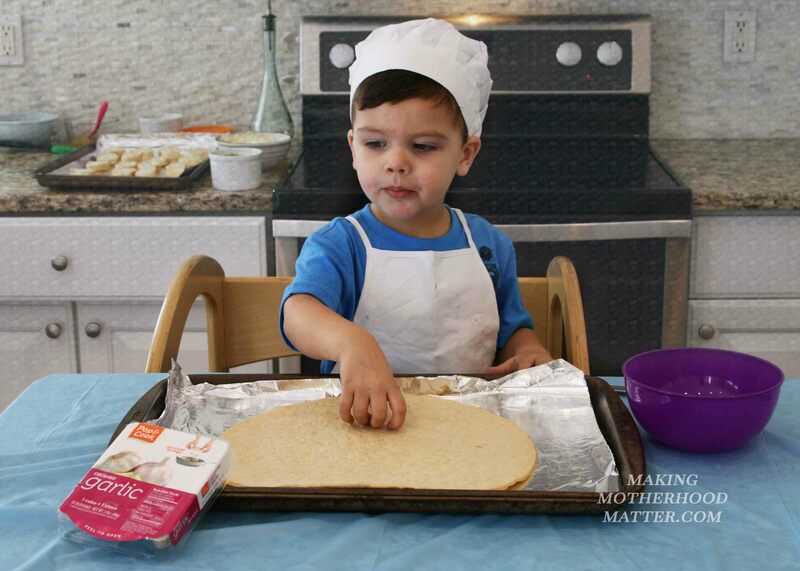 Pop & Cook is perfect for cooking with and for kids because no knives are needed when you use their products. Plus, there is no cleanup. Winning! 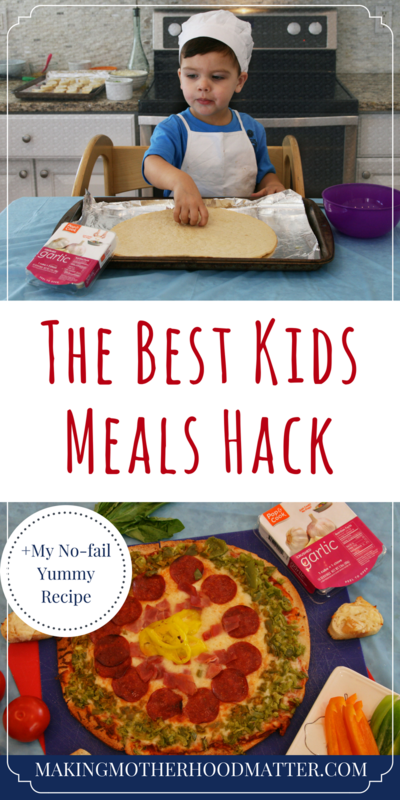 We also used canned pizza sauce and pre-made dough to keep things simple. Check out the printable recipe for rainbow pizza (with veggies… shhh!). 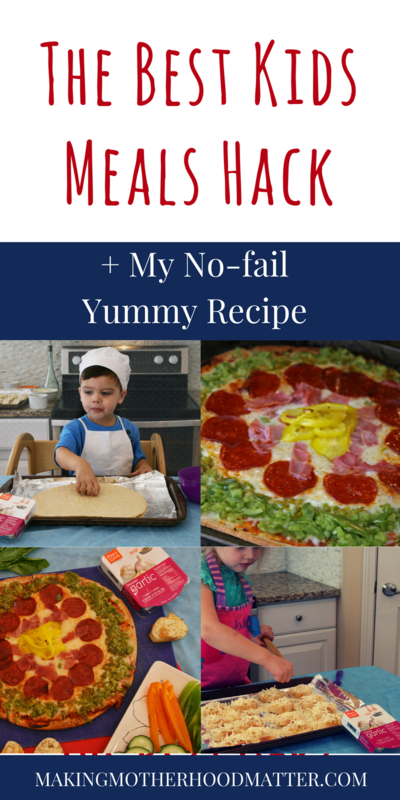 I used green peppers, pepperoni, ham, and yellow peppers, but I recommend using items you think your child would like to make this no-fail recipe. Also, I like to serve it with cheesy garlic bread bites and sliced veggies like peppers, cucumbers, snap peas or any veggies you think your little ones might try. And don’t forget to make life easy for anyone who likes to get dinner on the table quick by grabbing Pop & Cook ingredients from the nearest Walmart. What kids meals tips or tricks work well for your family? You may also like Vegetables for Kids: The Truth About How I Get My Kids to Eat More Veggies. 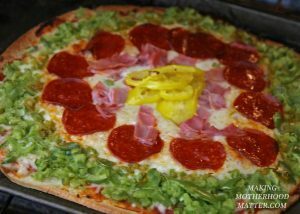 Check out the printable recipe for rainbow pizza (with veggies... shhh!). 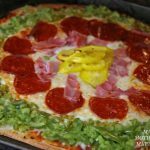 I used green peppers, pepperoni, ham, and yellow peppers, but I recommend using items you think your child would like to make this no-fail recipe. 1 chopped green pepper, pepperoni, sliced ham, yellow pepper, plus whatever sounds good to you. Heat olive oil in a pan. Saute garlic until slightly browned, about 2 minutes. Spread sautéed garlic and oil on premade pizza crust. Sprinkle a pinch of oregano across the crust. Spread pizza sauce evening on the crust. Add mozzarella cheese. Layer toppings in a circular pattern starting from the outside and work your way in. Bake according to the directions on the pizza crust package. For me, it was 15 minutes at 425 degrees.